"I love the ceiling - it is so beautiful! I've been showing it off. Not only is the ceiling beautiful, but it's so peaceful, too! Easy to sleep in the bedroom now!" Lois Q. Who hasn't at one point or another fantasized about being out on some remote tropical island with their sweetie on a romantic getaway for two? Taking a walk along the beach at night with a blanket in hand, perhaps a bottle of wine and some decadent dessert. You look for a secluded spot in the sand that's soft to be together, away from the rest of the world. As you sit upon your blanket, you hear the sound of the surf rolling in and out onto the beach. Crashing waves drown out all other sounds, you snuggle in closer to hear each other's whispers. You're holding hands, she's got her head resting on your shoulder. In that moment, you both happen to look up and WOW....you're surrounded by thousands upon thousands of stars in the sky! This canopy of stars envelope you, you've NEVER seen so many stars in your entire life! Stars of all sizes and dimensions...look, there's a shooting star! "Quick!! Make a Wish" you say to your sweetheart! You toy with each other trying to draw out the other one's secret wish....when in fact, you both wished for the same thing....that this night would never end! The most dazzling display of stars you both had ever seen, as if the universe just arrange that for you both to enjoy! It felt like you two were the only people on earth witnessing this magnificent beauty. There is something so special about the stars that truly inspires romance and love. You sip a little wine, you feed each other some rich sensuous chocolate cake, all while enjoying the most breathtaking view ever. You comment about how you never see stars like this back home in the suburbs. "Imagine how amazing it would be if we could see starry skies every night just like this!" the other replies. Now imagine if you could recreate this magical night in the comfort and privacy of your own bedroom! Whether you're living out a fantasy of making love under the stars or just looking for a way to liven up your love life or even rekindle that old feeling of passion and love, my starry murals will do the trick! A Starscapes® will surely inspire romance...it's like your own private getaway each and every night! Love is what it's all about, we've all been there at some point in our lives....it's time to treat yourself and your sweetheart to the most amazing gift ever! The gift of the stars to inspire Love and Romance each and every night! 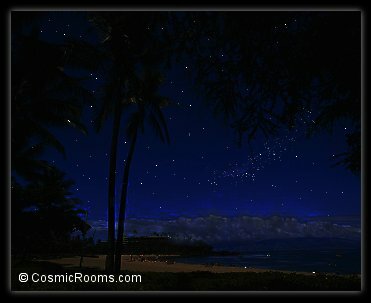 It's wonderful to be able to go on a romantic getaway vacation to some tropical paradise but if you're looking for something that's instantly gratifying night after night right now and not when you have vacation built up at work, my starry ceiling murals are the exact thing you need in your life...and your love life! 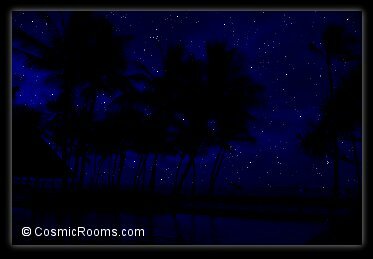 Ask me for a romantic starry mural and I'll include extra shooting stars, magical dream stars, and an array of dazzling elements that will sure to make your mural spectacular! Contact me today to schedule your free in-home demonstration and start romancing under the stars tonight and every night! "You did a beautiful job on the ceiling, I wish I had the money to get the entire house done!" Maria F.